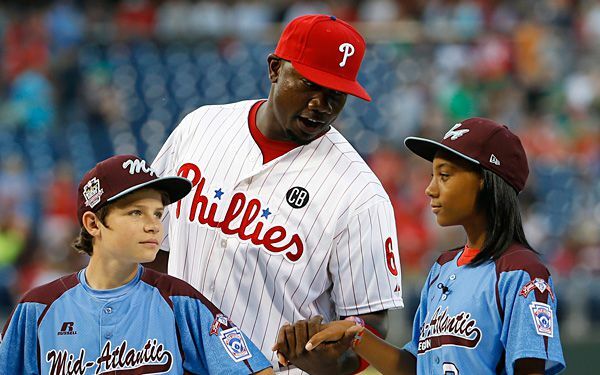 Little Leaguers meet Big Leaguers in Phila. The 13-year-old star female pitcher, Mo'ne Davis, and her Taney Dragons teammates who thrilled Philadelphians and many others at the Little League World Series got to meet their favorite major league team Wednesday night. The Philadelphia Phillies hosted a tribute to the team at Citizens Bank Park. Their game against the Washington Nationals started 28 minutes late because of the festivities. The Dragons walked through a procession onto the field and were greeted by the Phillies. All 12 members of the Dragons threw out ceremonial first pitches simultaneously to Phillies players. Earlier, the Dragons received champions' treatment with a downtown parade. Thousands cheered the Dragons and Davis, who made it onto the cover of Sports Illustrated. "A lot of people were here," she told WPVI-TV. "I didn't think that many people would be here, but it was nice." "Who turned out is what I'm so taken aback by," team Manager Alex Rice said. "You start in town with office workers and it just got better and better as it went down Broad Street." The Dragons represented the mid-Atlantic region in the World Series. They won their first two games before being eliminated, losing to Las Vegas and to eventual U.S. champion Chicago. Mo'ne became the first female pitcher to win a game in the series' 68-year history. Her last start drew record-setting TV ratings for the series. "They did a good job of bringing the city together," said Jerome Belo, 55, who on a day off made it a point to be on hand to watch the start of the parade. Others at the parade, such as 49-year-old Eleanor White, said the team united the city through its play on the field and the parade itself. "You have all different walks of life, you have all cultures together," said White as she walked along the parade route. The team traveled about 4 miles by float from the downtown business district to a park in south Philadelphia for a rally. Musical performances were held along the route. The previous parade the city hosted to honor an athletic accomplishment was in October 2008. That was after the Phillies won the World Series. Critical thinking challenge: Why would Sports Illustrated a magazine for adultsput a child on its cover? Were any adults in the record-breaking TV audience? What turned a lobster blue? Wow that was really cool about learning theese facts but I'm not a big fan of baseball but now I am gogirl and work it. It's pritty amazing they went to the worl series I will like to be that girl some day.I wanted to play softball but now I want to play baseball.And now my dad will talk about it all the time mabey on the phone to bye. I think they deserve to be put on sports illustrated because they are two good baseball players and they got to meet one of the best baseball teams in the country. Based on this passage, Mo'ne Davis played in the 2014 Little League World Series. Mo'ne was the first female pitcher to win a game in the series' 68-year history. I think that Mo'ne was on the front cover of Sports Illustrated because she had a 2-hitter game. Even though the Dragons didn't win the tournament, Mo'ne was the first lady to pitch. Losing against Chicago in the U.S. championship, Korea ended up winning it. Congratulations to Mo'ne for pitching! I play many sports and baseball is one of them. I'm proud for the Philadelphia team especially fro Davis. I like baseball it's a great sport to play. I wonder what it felt like to pitch the whole game. Remember that she is a girl. So congratulations Davis and the Philadelphia Dragons. They did great, but I like all Chicago teams especially JRW!! All Chicago is proud for you and you should be to. Sports illustrated would do this because this 13 year old girl is better than half of the boys on the baseball team, which is for boys. I applaud Sports Illustrated for the way they welcome the girl to the magazine. I really think this story is amazing that such a young girl could be this great at baseball. All world round this girls has been talk about. This young girl is way better than most 15 year old boys. This is a pretty cool story. It was awesome to see a girl pitcher do so good in the Little League World Series. It is cool that they got to meet some of their role models.